Offers: Various 'Stay & Play' discount packages available plus other promotions. Contact club for details. Clubhouse with changing rooms, bars, restaurant, leisure facilities, accommodation and pro shop. Golf facilities include practice areas, golf academy and equipment hire. 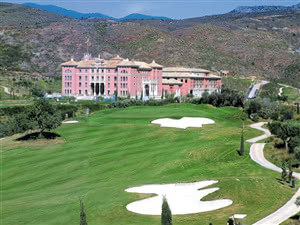 Owned by a subsidiary of the Ritz-Carlton Group Flamingos Golf Club, set in a beautiful valley to the west of Marbella, opened in 2001 and has grown every year since. The luxury resort currently offers a hotel, leisure facilities, luxury villas, two 18 hole golf courses (Flamingos and Alferini) and a 9 hole course (Tramores) with another 9 hole 'executive' length course planned. The original 18 hole course, Flamingos, 5,714 metres off the back tees, was designed by Antonio Garcia Garrido and opened in 2001. Flamingos is characterised by careful conservation of the natural landscape and its integration into the course. The fairways can be narrow in places demanding accurate shot placement but the greens, although well protected, are large and receptive. The second of the 18 hole courses, Alferini, is 6,632 metres off the back tees and an even tougher challenge than its sister course. A game on either course will prove an excellent challenge of your golf and provide you with some fantastic views of the mountains and the Mediterranean.